This Williamsburg building has two big things going for it: lots of space and a central neighborhood location. The home is right around the corner from the Bedford Avenue L train, and it holds two apartments and a ground-floor commercial space. 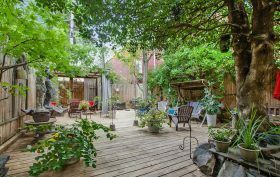 Out back, there’s an incredible private backyard that looks like the best part of the property, which is now on the market for almost $4.49 million.